Yuca root (also spelled "yucca"), is widely available though it tends to be a food that many of us pass by in the grocery store. Though modest in its appearance, yuca (also called cassava or manioch, depending on where you are in the world) is a versatile starchy root which can be prepared in a variety of way. In fact, flour that comes from the the yuca root is what makes up tapioca. Peel the tough skin off and underneath is a white starchy flesh, similar to a potato but more dense and rich in taste. There is some research to suggest that consumption of yuca root can lead to lower blood glucose and cholesterol and may also lower blood pressure. Some plant nutrients in yuca root are also observed to be anti-inflammatory and beneficial for conditions like osteoarthritis. In some areas of the world, yuca is even thought to be beneficial in cancer treatment and prevention (although the American Cancer Society says there is no convincing evidence of its effectiveness). It is clear though that yuca is a staple food in many native diets all over the world. 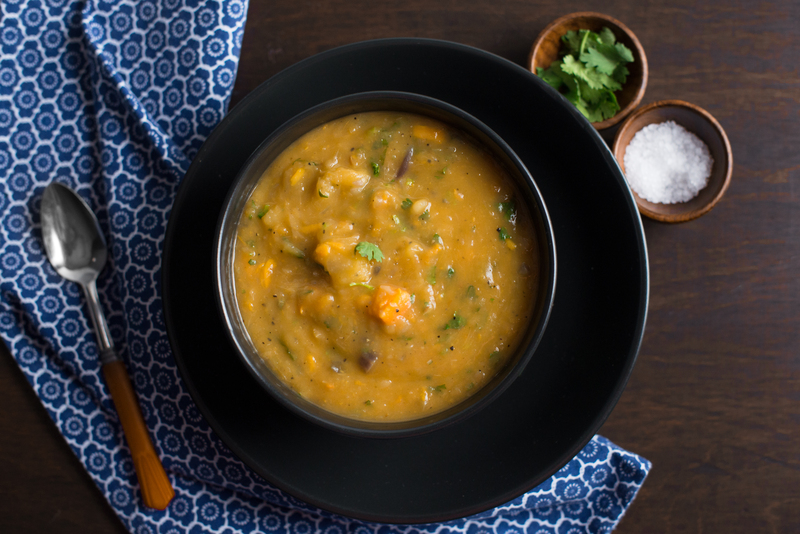 This soup is a basic soup that can be adapted in many ways. Add lentils for more protein. Add a handful of other veggies or greens you have on hand, or throw in a a few raisins for a sweet “pop” with each bite. Add a half cup of coconut to make this a "Healthy High Calorie" option. Heat the oil in a large pan. Add the onion and garlic. Stir fry until the onion is translucent, about 3-5 minutes. Add the sweet potato and the yucca root and keep stir frying for another 3 mins.Add the broth and the spices, salt and pepper. Cover and cook on low heat until the sweet potato is soft, at least 35-45 minutes. Just before the soup is finished mash the yuca and sweet potato slightly to create a thicker broth. Add optional coconut milk to boost calories and creaminess. Serve in a bowl, and sprinkle the cilantro on top and enjoy! 5-6 servings, double for a great "Cook Once, Eat Twice Meal"